Homicide Lieutenant Jacqueline "Jack" Daniels is in some serious trouble. Her boyfriend wants to get married. Her partner wants to transfer to another department. Her dead father may not be dead after all. And a brilliant sociopath known as the Chemist is poisoning Chicago's food supply, killing hundreds of people. Jack is put in charge of the case. But how do you catch someone who is always in disguise, who ingeniously spreads toxins in restaurants, grocery stores, and fast-food places without leaving any clues? Time is running out. The Chemist has something big planned - something really big - and Jack has to push herself to the limits of her capabilities, or else everyone she knows and everything she holds dear will be destroyed. 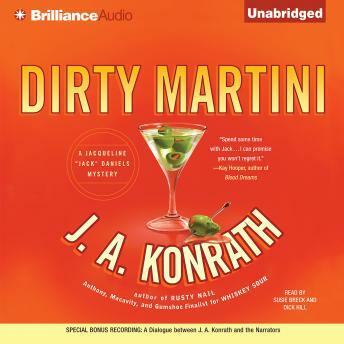 In Dirty Martini, Jack faces her toughest adversary yet: a sicko who wants to murder an entire city. Can she catch him - and decide whether to accept boyfriend Latham's surprise proposal - without destroying both her reputation and her sanity? Good book. Was looking for a series and this one is ok. Not the absolute best but worth listening to. I enjoyed this book. It seemed to have more plot with twists and turns compared with the others in the Jack Daniels series. A good listen with a good pace. While the writing is mostly interesting, I find the Outrageously evil bad guys to be tiresome. Can't they just be sorta crazy? Maybe swept up in circumstances? Geez. My first Konrath novel. I love female heroines (ie Kinsey Mullhone - Lindsey Boxer) and Jack Daniels is my favorite drink so I had to try this book. But seriously it kept me centered and could hardly stop listening. Will add his other books immediately to my want list. How could I ever have missed this one?? The story and the plot sounded very good however, I could not get past the first CD. The reader was awful. I am going to read this series but was hoping to find something interesting for my long commute.